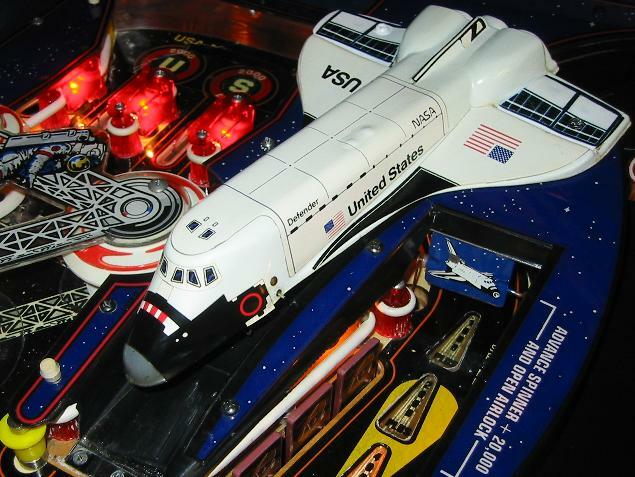 The Shuttle toy is an integral aesthetic part of the playfield. This was its restoration flow from start to finish. is the one that originally came with the machine. Original Picture. wings repaired with two-part epoxy. Afterwards, the excess was cut and sanded off. the wings. This stiffens and strengthens the shell considerably. 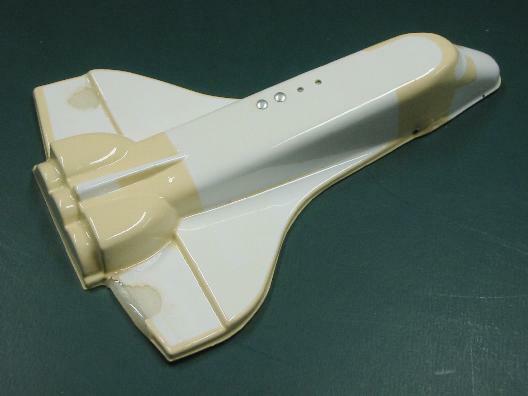 I stiffened the toy by epoxying a piece of aluminum flashing into the bottom. It fit neatly inside of it due to the lip all the way around the toy. Once the epoxy hardened I could tell that the shell was now much stronger and stiffer because, when tapped on a table, the shell rings at a noticeably higher frequency. 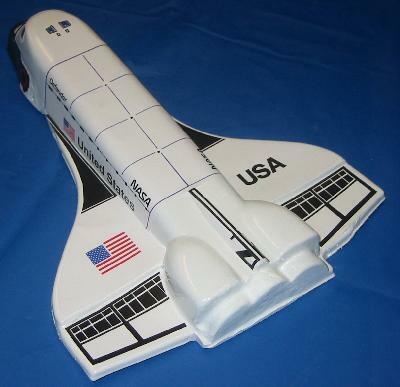 The piece of flashing was bent and cut to fit the underside of the toy without imposing twist on it. 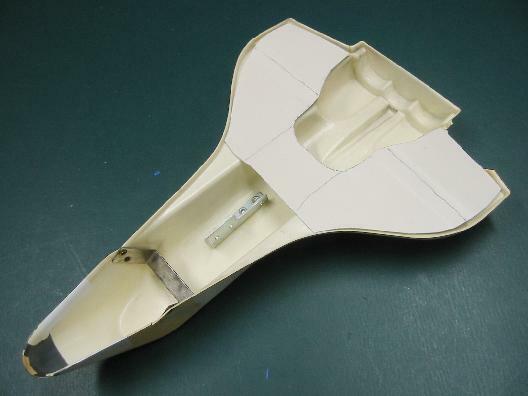 The part in the middle across the fuselage that connects the left and right wings will be used to support a circuit board in the future for a light mod. 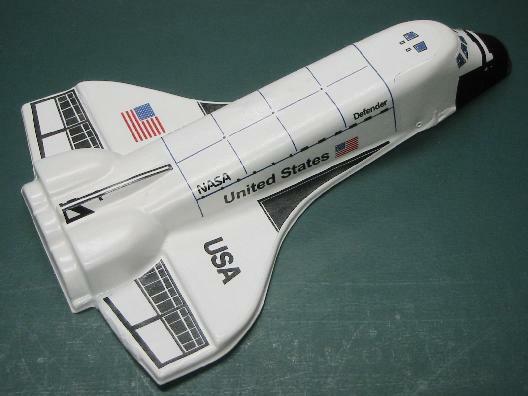 My intent is to have the Shuttle toy light up when the Shuttle on the backglass fires its engines. I scanned the stickers in, and then redrew them in Visio. This allowed laser-sharp graphics. I then printed them out onto a full sheet of sticker paper, and then sprayed it with clear paint to seal it. for plastic items. Afterwards, I buffed the surface shiny, and painted the nose gray. which is a mostly unmodified toy. Discovery, Altantis, and Endeavor? Nope. 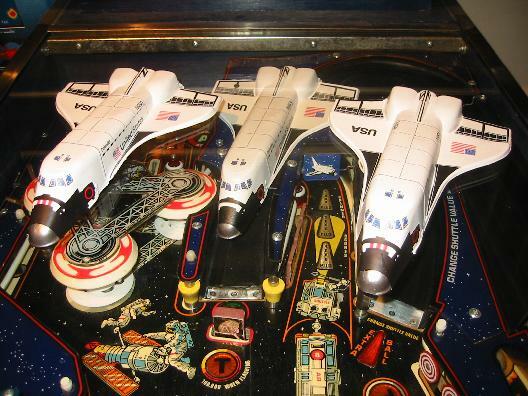 Three 'Defender' Space Shuttle toys. All restored by the same process. This does not include a few units individually sold on Ebay. trade-in. 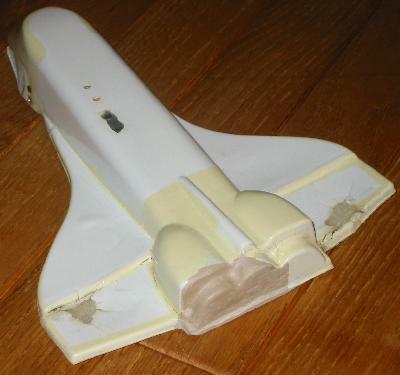 As you can see, the tail section is missing and the wings are damaged. 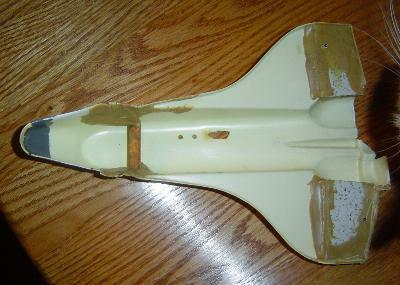 This restoration done in April 2007.
the tail section. The holes in the wings were also repaired. The finished unit after painting and application of new decals. I returned back to the nerve wracking task of the mylar removal. One good source of freeze spray is a can of air spray (for dusting components) held upside down. I purchased them at Staples for $8 for a 10 oz can. Compare this to Radio Shack which cans cost twice as much on a per ounce basis. Also, the Staples air can has a pull trigger which is easier to control. you can see that only a few dots of paint lift up at the inserts. Here is all the old mylar. As you can see, only a very small amount of paint was taken off. Phew, done! All the mylar is off. Now I need to touchup the paint. It took me four 10oz. bottles of Freeze Spray to remove all of the mylar. 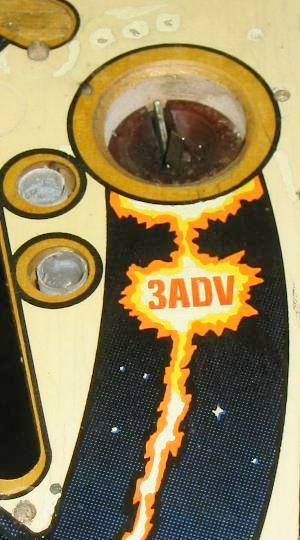 I probably could have used less, but I did not want to take a chance with the playfield paint. I then used IPA alcohol and Magic Eraser to wash the glue off. This was not as bad as I had expected it to be. That latter process required 2-3 ME pads. One important tip I would offer is to shave the dried and black residue from the previous days' work off to expose a fresh clean surface every time. 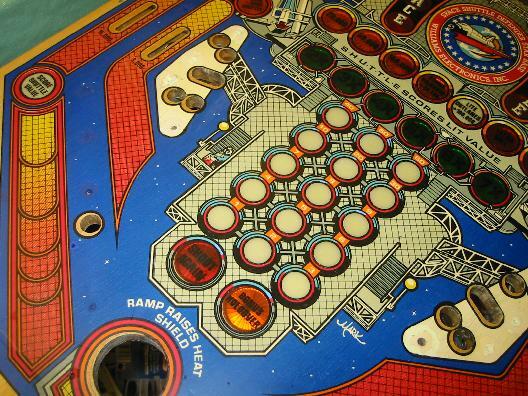 This way you do not rewipe the playfield with a dirty sponge. 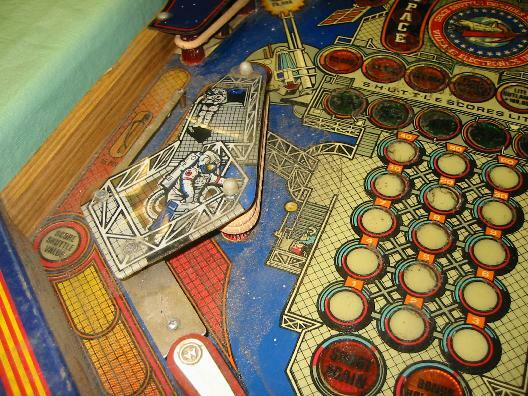 Once that was done, it was time to touchup the playfield. I started at the top to develop my skill in painting and mixing paint as that is the portion that the player sees less. I then progressed to the parts nearer to the player. Refurbished ball lock area. Left: before, right: after. The ball locks were not mylared, so they saw a great deal of wear. I decided to repaint the white, yellow, and orange parts, and made a stencil for the text from waterslide decals. It is important to minimize the time that the decal stays wet. I initially let it dry naturally, and the sharp lines blurred overnight. From then onwards, I used a hair dryer to dry the decals. By the way, I have no idea what "3ADV" means, triple advance maybe? Take a picture of the area with a thin ruler in the image. Make sure you are as normal to the surface as possible. Paste the picture into Visio, and adjust its size such that the photographed ruler matches the internal one in Visio. Trace the image with straight and splined lines. Print out onto the decal paper. Spray with clear spray paint to set the decal. Cut decal out and soak in water to release. Slide onto the surface and dry with hair dryer. 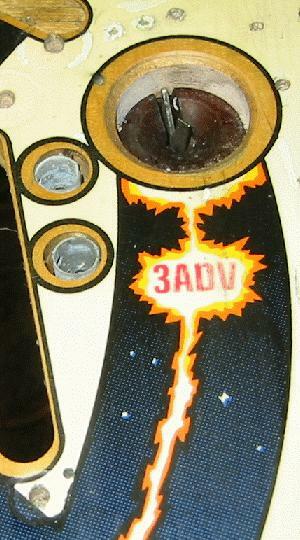 Some more touch-ups on the playfield. I was able to match the colors fairly well. Left: before, right: after. 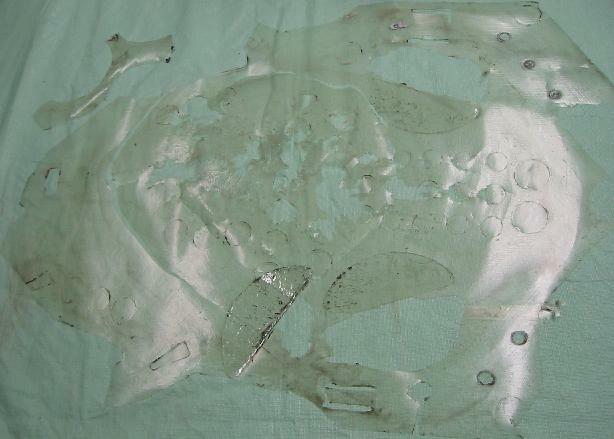 paint by the clear insert is typical damage caused by the apron when it is attached or removed. The other significant area of touchup was above the pop bumpers. See here (you may have to hit reload after clicking). 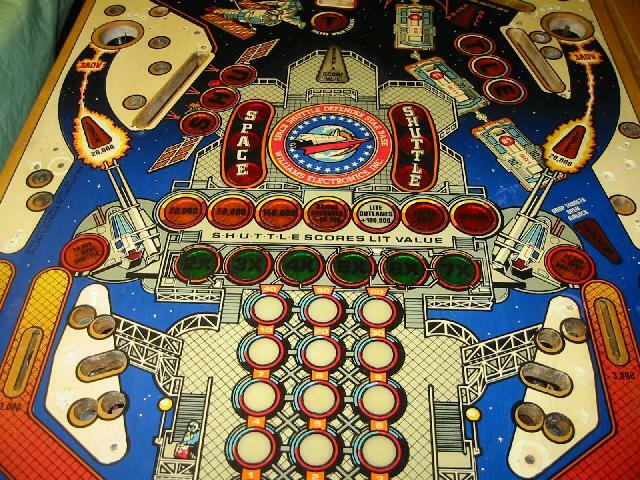 Most of the touchups on this playfield were very small. Tiny pits or cracks near the inserts were the majority of them. This made it easier to match the colors, but I still put in the effort to do a very good job with the match. Two problem types remain, both of which unfortunately do not seem to show up clearly in photos: One is ball swirls in areas not covered by the mylar. For example, in the yellow checker boxed area below the Heat Shield have significant signs of ball swirls that I was unable to remove with alcohol and Magic Eraser. 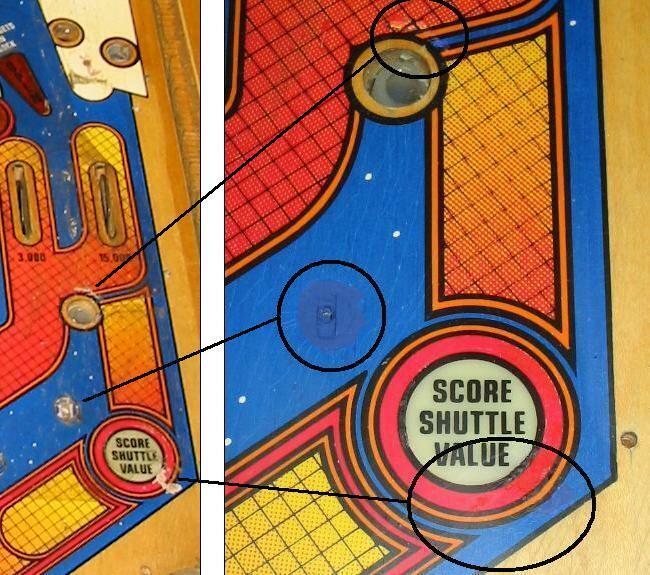 The second problem is faint crazing in the paint all over the playfield, which I attribute to the fact that the paint is more than 20 years old. You can faintly see this effect in the blue area next to the "Score Shuttle Value" (see above). I found a good solution to the second problem during the clearcoating process. Alcohol seems to be the way to go instead of water. I haven't had any problems with water but next time I'll use alcohol and see if it aids in clean up in any way. I do all my clean up with Fantastic & Magic Eraser first, then I try to paint match as much as I can and store the mixed paint in small bottles ready to use. If I'm going to clearcoat I then sand using 600 grit wet & dry sand paper. (if not clearing I use the sanding method described with the novis). Next I touch up using the pre mixed acrylic paint. If any more paint matching is needed I wet down the area with Naphtha to bring out the true color. It dries fast so I put down a spot of the mixed paint then whip a bit of naphtha next to it to see the match. After all the touch up is done and the acrylic paint dries a day or tow I wet a rag with Naphtha and wipe down the whole playfield fully and liberally. Avoid the touched up areas if possible but the acrylic paint is real tough once dry and stands up well to a small amount of naphtha. 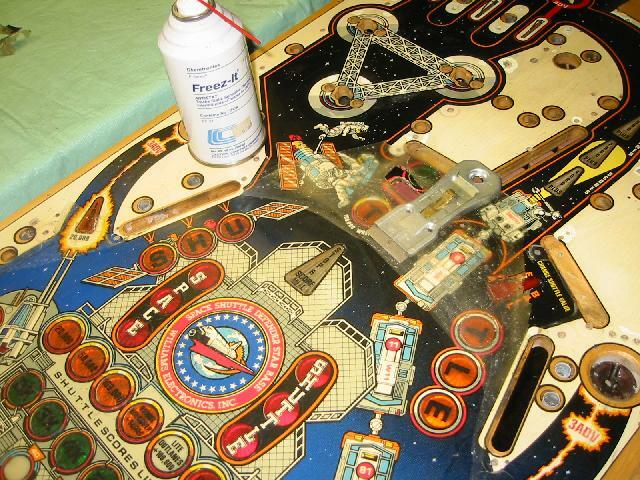 wipe down the playfield once more with the Naphtha just before the clear coat process. 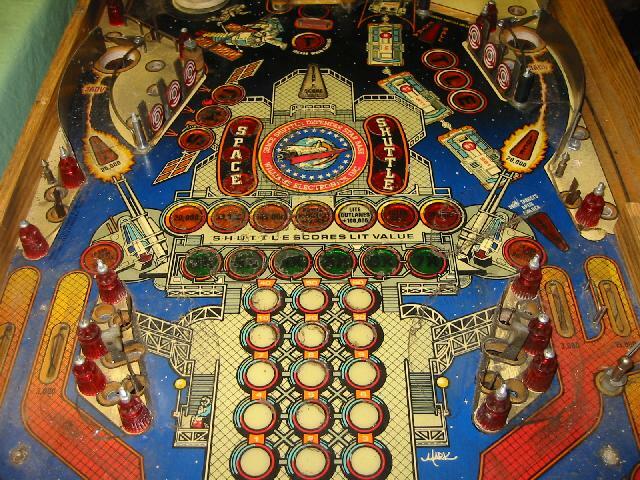 (Note: if the playfield is in real bad shape then it may be worth the extra effort and expense to clearcoat first and then do the touch ups and clear again). Let me know when your ready. I can have it on it's way back to you in a week or so. 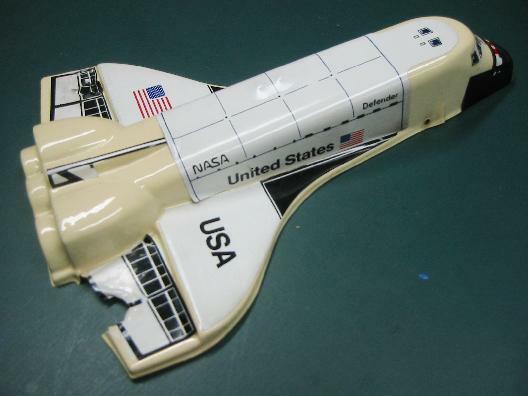 That Mylar on Space shuttle is real hard to remove. I've always had good success with the freeze spray method but not on the SS I did. Goo Gone did not touch it. Heat and Goo Gone may be the way to go but I'd try just heat first. I ended up using a touch of acetone because and lost a bunch of paint and artwork in the process but that was OK as I had to repaint the whole area anyway. Keep in touch and let me know how it all goes. This is the main lineup of some of the paint colors that I used to match the playfield colors. These were the paints I used to match the playfield colors, most purchased at Michaels Craft Stores. Since my wife has a very large selection (maybe 50 bottles), I was able to find a match by painting a clear plastic card for sample dots. Blue : Crafters Edition Acrylic Paint #72022 "True Blue" - Mixed with a few drops of black to darken it, this produced the poorest match, and is visible in areas with large touchup. Fortunately, none of these areas are readily visible. Mainly below posts and guides. Red : Crafters Edition Acrylic Paint # 72007 "Real Red" - This produced an excellent match right out of the bottle. Usually invisible except in certain lighting conditions. Orange : DecoArt Halloween Acrylic Paint "Pumpkin Orange" - Out of the bottle a very good match. I just added a few drops of black per teaspoon to darken it slightly. Grey : Crafters Edition Acrylic Paint #720033 "Grey" - After darkening with drops of black, this produced a reasonably good match. Only used for thin lines, so it does not stand out. Black : Delta Ceramcoat Acrylic Paint #02506 "Black" - Touchups with this flat black dries practically invisible. An excellent match. Do not use gloss black. Yellow : Crafters Edition Acrylic Paint #72010 "Bright Yellow" - Another excellent match right out of the bottle. Touchups disappear without adjusting the color. Playfield background : Crafters Edition Acrylic Paint #72011 "Lemon Yellow" - Mixed with White and Grey to match the background (under the ramps, on sides, etc). See text below. The Playfield background, which is a very light yellow was the most time consuming to mix. I basically started with Lemon Yellow, and kept lightening it with White. After a while, I added some drops of Grey to take the edge of the bright color, and came up with a pretty good match. This color was used around the ball lock area; the transition is invisible in the picture. Because of the long mixing process, I ended up with several teaspoons of paint, which I store in a film canister for later use. In addition to the colors, I also used "Acrylic Flow Improver", which thins the paint for delicate painting without causing blobs of paint and without weakening the colors like water. As for painting tools, since I am a novice, I could not get brushes to produce the quality I wanted. I ended up painting with toothpicks and a needle. The latter tool is nice becuase it allows ultra-sharp results, and cleans up with a wipe, so you can use one needle and change colors quickly. I could not have painted the ball lock area without this technique. 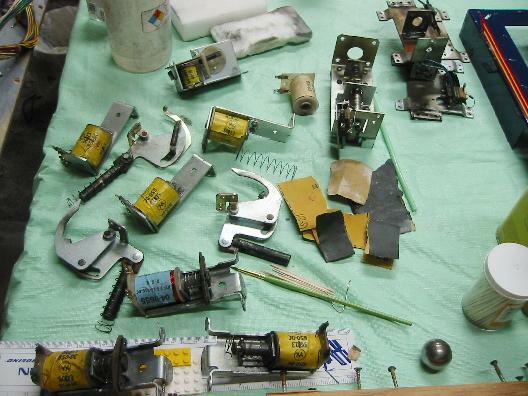 In order to prepare the playfield for clearcoating, and to service the moving parts such as coil sleeves, I removed all the under field solenoids. 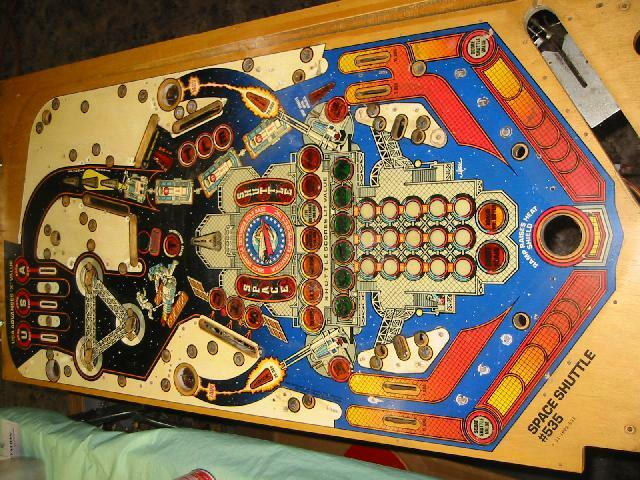 After this only the harness and the light bulb sockets remained under the playfield. All the metal parts were cleaned, sanded, and then polished in my vibratory case polisher from Frankford Arsenal. I picked up this tip from Clay Harrell. this picture. After a day's use, I shave the dirty parts of with a razor to expose a clean surface. 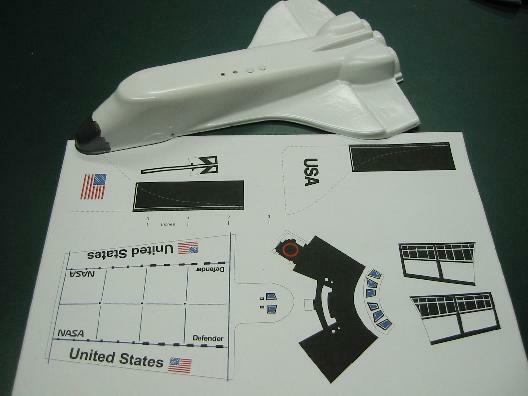 Prior to this step, I took detailed pictures of the underside so that I could go back to the wiring configuration. in my mini benchtop grinder with a fiber wheel (for sanding), then I tossed it into the polisher overnight. Before is at the top, after on the bottom. 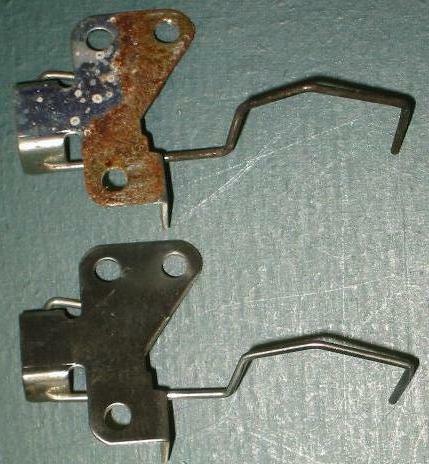 All moving metal parts were similarly treated. The fine particles of the vibratory polisher reached the parts I could not reach before. After several weeks of intermittent work, a major milestone was achieved. The playfield is ready for clearcoat. Some pictures shown here. of white inserts at the bottom of the image. 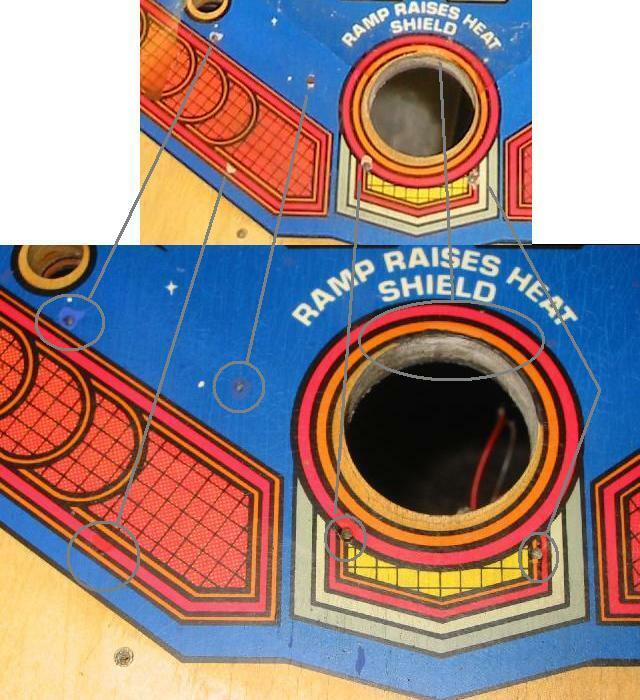 Before (top/left) and after (bottom/right) of the lower part of the playfield. The blue looks so nice. (c) Edward Cheung 2005, all rights reserved.